Controversial world champion athlete Caster Semenya has arrived home in South Africa to a rapturous welcome. Hundreds turned out to greet Ms Semenya and fellow medallists, men's 800m champion Mbulaeni Mulaudzi and long jump silver medallist Khotso Mokoena. Police restrained the singing and dancing crowds as she left the airport. South Africans have rallied behind Ms Semenya, who won the 800m women's final last week, hours after news broke that she had to take a gender test. The whole team is expected to meet President Jacob Zuma later. The BBC's Karen Allen in Johannesburg says the intention is to shift the emphasis back to the country's sporting achievements and show that it stands proud despite the controversy. The ruling African National Congress had helped transport people to the OR Tambo airport wearing the national colours of gold and green. Some sang and danced as they waited. Others held up messages of support. Posters read "our first lady of sport", "welcome home Caster, our champ" and "Caster 100 percent female". After their arrival, the athletics team was whisked off to the airport's parking area where more crowds waited to catch a glimpse of them. They were taken to a stage, where Ms Semenya gave a thumbs-up to the crowd and said: "Hi everybody". The BBC's Jonah Fisher in Johannesburg says she was mostly subdued, although the crowd was trying to raise her spirits and she did smile a couple of times. Ms Semenya's family was at the airport to welcome her home. 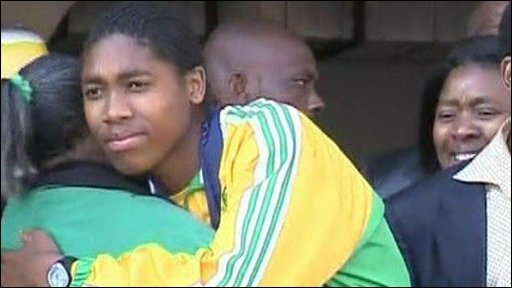 Many fans had waited for hours in the chilly winter morning to catch a glimpse of Caster Semenya arriving back in South Africa. In the event, she didn't speak to the crowds and she didn't speak at a press conference called by local athletics body, Athletics South Africa. But she did get on to a hastily erected podium outside the airport to join in with a dance for a few seconds - before rejoining her fellow medal winners. Most of the fans left the airport with smiles on their faces, happy to have seen their newest sporting star. AFP news agency quoted her uncle, Ben Semenya, as saying: "Caster is a girl... I am not worried about that too much. Caster is like my child. I know where she comes from. For myself, I know Caster is a girl." The ex-wife of former President Nelson Mandela, Winnie Madikizela-Mandela, also greeted her. "We are here to tell the whole world how proud we are of our little girl," the Associated Press quoted her as telling the cheering crowd of fans. "They can write what they like - we are proud of her." Our correspondent says Ms Semenya then sat silently through an hour-long news conference, looking mortified as various officials spoke in her defence. Ms Semenya's family in Limpopo province has shown the BBC her birth certificate, which states she is female. Athletics South Africa President Leonard Chuene last week told a local paper he had had to "persuade" the athlete to go to the podium to accept her gold medal because she was so upset about the gender row. The ANC women's league said it viewed the order for the test by the International Association of Athletics Federations (IAAF) "as [a] vicious attack on the dignity of Caster Semenya and all women athletes because they suggest that women can only perform to a certain level and that those who exceed this level should be men". IAAF President Lamine Diack accepted that the affair had been handled badly. "I deeply regret that confidentiality was breached in this case and that the IAAF were forced into a position of having to confirm that gender testing was being carried out on this young athlete," AP quoted him as saying on Sunday. "It is a regrettable matter and I have requested an internal inquiry to ensure that procedures are tightened up and this never happens again." The IAAF ordered Ms Semenya to take the "gender verification test" after she improved her personal best by more than eight seconds over the past year. The IAAF stresses that it does not suspect her of deliberately cheating, but questions whether she may have a rare medical condition which gives her an unfair advantage.